Set your '02-'08 Dodge Ram Truck apart from the rest with this classic AAR 'Cuda style body side graphic set. Available in a wide variety of colors, graphic measures 200.539" (509.37cm) in length (Quad Cab version) and is packaged with one (1) left and one (1) right side graphic. Looks Terrific! 20" (50.80cm) extensions are included at no extra charge for Mega Cab models. Kit can easily be trimmed shorter at the front for Regular Cab trucks. Graphic is designed to simply install approximately 2" (50.80mm) below the window(s) as shown and requires slight trimming at each door jamb and Cab/Bed connection once installed. Please Note: Graphic kit shown is designed for installation on a '02-'08 Dodge Ram Truck with a 6.25' Short Box. While the kit may be installed on a truck with a 8' Long Box, rear box graphic will not follow shape of the long box flare. 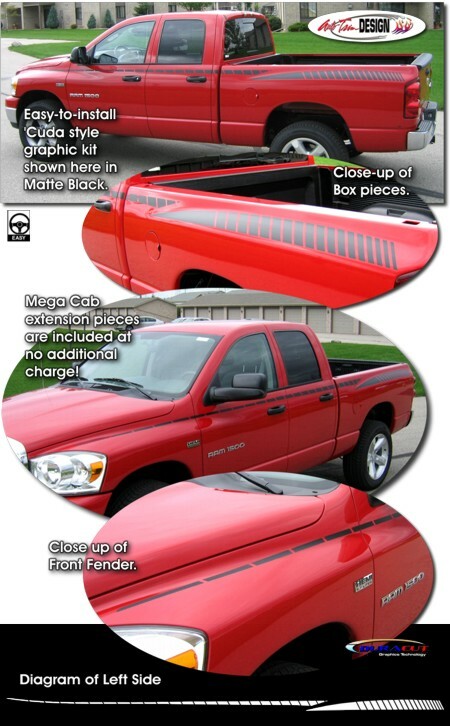 Graphic kit is also available for '03-'08 Dodge Ram Truck with Full Fender Dually flares.